Pace-resistant Private Zone Enters Cigar Mile: Under new trainer Brian Lynch, Private Zone will attempt to defend his title in the Cigar Mile (GI) on Saturday at Aqueduct Racetrack. The race formerly known as the NYRA Mile launched the magical win streak of Cigar from 1994 to 1996. It consistently attracts top-class horses, despite its late calendar position. Private Zone won last year’s edition of the Cigar Mile by five lengths for trainer Alfredo Velazquez and the ownership group Good Friends Stable. Private Zone won last year’s edition by five lengths for trainer Alfredo Velazquez and the ownership group Good Friends Stable. After switching to the Jorge Navarro barn earlier this year, the gelding was moved to Lynch’s stable just after he finished second in the Breeders’ Cup Sprint (GI). Lynch spoke to Steve Sherack of Thoroughbred Daily News last week about the change. “Obviously, you’re always thrilled to get a horse like this in your care and hope that you have as much luck with him and do as good of a job as the previous trainers,” Lynch said. It is unlikely Private Zone will regress in Lynch’s care. He won graded stakes races for Navarro, Velazquez and the Southern California-based Doug O’Neil. The only factor capable of slowing down Private Zone is age, but as a six-year-old gelding, he might be able to continue at this level for one or two more years. One defining quality of Private Zone remains his ability to withstand a fast pace and keep going. In the Sprint, Private Zone contested fractions of :22.05 and :44.31, before opening up in the stretch and grudgingly giving way to the freak sprinter Runhappy. In the previous Cigar Mile, Private Zone set the pace in splits of :22.18 and :44.18. 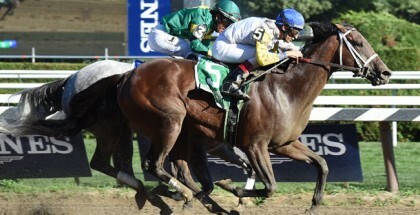 He opened up in the stretch and won by five lengths over Secret Circle. Of course, relying solely on fractions is a poor way to handicap pace. Private Zone ran uncontested on the lead last year, a scenario which helps any horse. When the leader must face another horse breathing down his neck for the entire first half, the job becomes more difficult. Can any horse pressure Private Zone in the initial stages? Godolphin Racing’s Marking, a three-year-old son of Bernardini and the excellent Seventh Street, offers some early speed for trainer Kiaran McLaughlin. Rider Jose Ortiz faces a hard decision from the rail on whether to engage Private Zone or try rating tactics. The latter choice leaves him vulnerable to inside traffic. Maybe Mshawish will change tactics? On paper, this five-year-old horse sired by Medaglia d’Oro looks like he prefers to come from a stalking position. 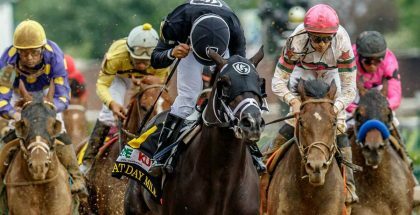 The clever Javier Castellano takes the call though and he might encourage an earlier run if no one else accomplishes the dirty work. How about Matrooh, the gelded son of Distorted Humor and Rockcide (relative of Funny Cide), and his chances of applying pressure to the expected pacesetter? In his North American debut at Gulfstream Park, he led every step. Trainer Christophe Clement sends out Tonalist, who wears blinkers for his initial Cigar Mile attempt. Unfortunately, even with the equipment change, the long-winded runner does not seem capable of challenging early. Clement also has another chance with Red Vine, who loves the one-mile distance. The son of Candy Ride will need help from the pace, but expect him to come late for another on-the-board finish. The miscue should give handicappers something to think about before unloading their money. 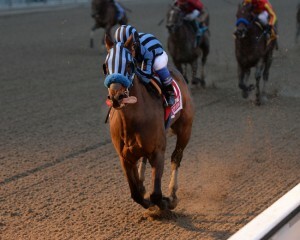 Otherwise, the Cigar Mile sets up perfectly for Private Zone and defeating him will be a difficult task. Mshawish, who could make a leap on dirt after a career of 19 turf races and one synthetic race, stands as the best value option.